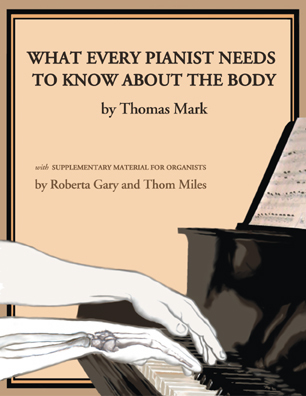 pianomap: The video "What Every Pianist Needs to Know about the Body"
In this video companion to the book, Thomas Mark describes and demonstrates the places of balance, standing and sitting in balance, structure and movement of the hands and arms, and other topics. Readers of the book who watch the video, follow the demonstrations, and imitate the movements will learn to experience the material, as if in an actual lesson with Thomas Mark. The video will help students to develop improved body awareness and a better quality of movment. Teachers will gain insight into common problems and how to correct them. Movement based on an accurate and adequate body map can transform a pianist's playing while guaranteeing freedom from injury. The basic concepts and anatomical information needed by pianists, which are presented in What Every Pianist Needs to Know about the Body, come to life in this video. The video is available in DVD format (Catalogue # DVD-566) or in VHS format (Catalogue # VHS-566). To order the book or the video, call GIA Publications at 800 442-1358 or 708 496-3800, or order online. "I have just finished the book and video and congratulate you on this remarkable contribution to our field. I watched the video very slowly thinking and trying out the various techniques. I am recommending it to all of our students." "Your book, in particular, has been enormously helpful to me. I read it when it first came out, after having met Barbara Conable at an MTNA conference, and it was life-altering for me. I'm using it this semester in my "Wellness for Musicians" course at Catholic University. This summer I finally watched your DVD, which was also very helpful. The kids in the course--which includes a singer, flutist, cellist, and clarinetist, in addition to pianists, have loved your book and it's been a revelation for them!"